I try to pick specimens that nicely represent the year and mint of manufacture, while keeping an eye out for value and price. 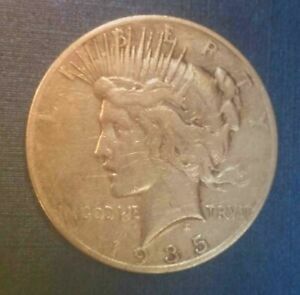 this piece, a 1935 S Peace Silver Dollar coin, meets my criteria. It is great with this being a circulated grade, that I can handle it and look at it without worrying about affecting it's value. So I am able to appreciate the art aspect of collecting, while at the same time I can sell for bullion price, if need be, with only minimum monetary loss. The price is right. I wanted the date very badly. I am very happy to own one of these key date coins. The front is so good. The back has a little more wear. I'm still very impressed. I have to have it. I will still be looking for more beautiful coins. But, the Peace Dollar will most likely always be my favorite. I wish I could buy everything single one I wanted but, they are expensive. The seller sold me something I've wanted for so long. I am grateful. It is a good coin for my peace dollar colection. It is not what I will keep if I can get a better grade. I received my order and when opened, the clarity was beautiful. Just like the picture that I bid on. My only recommendation would be to put any and all coins in a plastic sealed container in lieu of paper and staples.